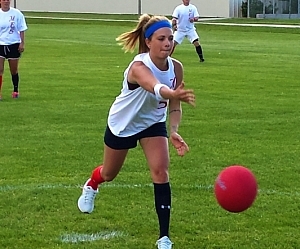 2018 Summer Kickball is here! 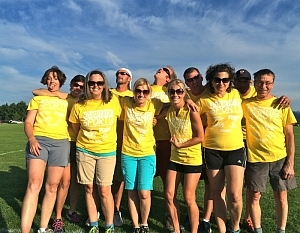 Registration for summer Kickball 2018 opens April 1st. New this year, the 10 person outfield will consist of 6 men and 4 women. Start getting your teams together now for a guaranteed six-week long league with the 7th week for playoffs for qualifying teams. 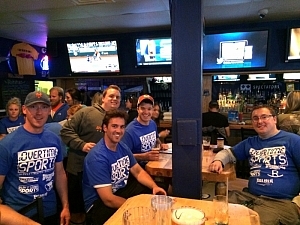 Each team gets a free pitcher of beer, win or lose, at the sponsor bar (Bar IX) afterwards! This team came out of nowhere in 2015 and ran the tables. 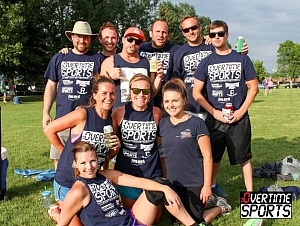 With cut off sleeves, sweet tattoos, and a disregard for authority, this team went undefeated in blazing fashion. With a revamps squad, a new fitness coach, they look to repeat in 2016. How in the heck did this number five seed advance and actually win the whole tournament? Well, the answer may have been in the unimagineable amount of upsets that happened the previous week, but regardless, Great Balls of Fire, who at the begining of the season couldn't start a fire with gasoline, mathes and paper, emerged as the best team in the league and earned their spot as a repeat champion team! 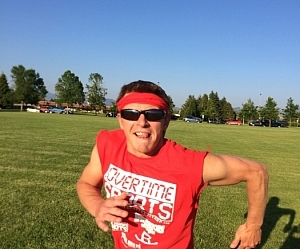 The second season of OTS kickball has been a blast and we wish we could turn forward the clock of time and see who is going to win the championship, but there is still a lot of action that needs to unfold first before that happens. Some interesting things have happened this seaosn. 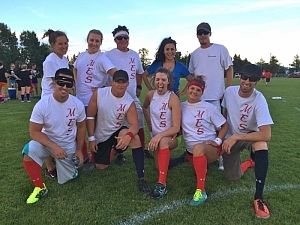 MES (Montana Exterior Specialists) have become a team to be reckoned with after an abismal 2 game skid to start the season. they now know how to catch on the run, where to throw the ball to make the right play, and how to look good for team picutres after games. They may not be the number 1 seed going into the playoffs, but they could be a favorite to win the whole thing. Then there is 2012 and 2014 Gallatin County Twerk champion Ronald Kleinsasser who plays 7 of 10 of the outfield positions at one time. It doesn't matter if he is playing shortstop, if the ball is kicked to first base because he will be there to make the play! There was also a team who struggled to pose on one knee for the team photo, which was absolutely hilarious to witness. It seems like ties have been the name of the game these first couple weeks. With 2 ties in the third week it is turning out to be a very competitive season for everyone. All new team One Kick Wonders is sitting at the top of the leader board waiting for everyone to catch up. Besides Frontline Warriors who are on the hunt for first everyone else is relaxing in the middle of the standings with one win. (Bridger Ballers and Rubber Busters I am not talking about you. We love you guys anyways!!) Keep up all the great plays and sportsmanship everyone!! See you next week! 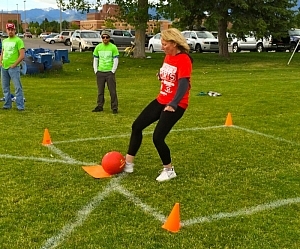 It was as great second week of kickball even though the weather only permitted us to play the first second game before on onslaught of rain and lighting permeated the fields around 7:15 making even 30 seconds outside seem like taking a shower. However, in the first round of games, there quite quite a bit of excitment. First year team MES is starting to show some sings of team playing as they ripped off several great catches in the outfield and even had a double play. However, Balls Deep, a perennial power house beat them 4-2. The indy team Blue Balls is starting to show some talent with their stable of players. If those you of who who were supposed to play at 7pm and your game was cancelled, be sure to check the webite, for your team will be having a double header either this upcoming week or in week 4. All, in all. it was a fun an exciting night. 1 week down, 7 more to go! 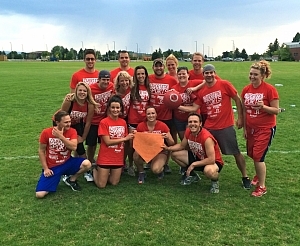 The Kickball gods were smiling for us last night. 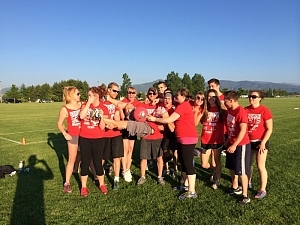 Giving us amazing weather, awesome people, and some sweet kicks in Tuesdays week 1 of OTS Kickball. Everyone who showed up was fired up and ready to play. 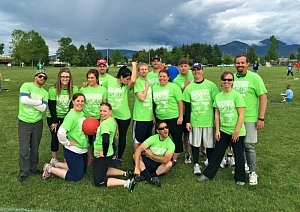 As ready as they could be after not playing kickball for the last 1-20 years. A shout out to all of our Players of the Games: Luke, Annie, Derek, Brit, and Ty who all had some amazing plays out on the field. For those of you who don't know if you are chosen as the Player of the Game (POTG) you will receive a sweet OTS coozie and key chain. What more could you ask for. Also something new this year. Whoever receives the POTG for the championship game at the end of the season may or may not receive a lot more than a coozie. More details coming later. For the first time in OTS history we sucessfully filled up Spectators Bar and Grill. 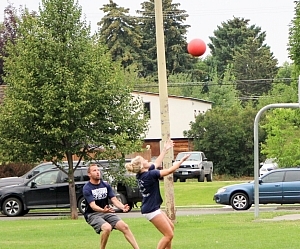 Kickball is only half the fun with us. The other half is the party after the game! Win or lose everybody had a great time after the games and I hear there was a double rainbow to really tie it all together.